Here in the South, we never get tired of the snow. I can count on two hands how many times we have had enough snow to "enjoy" and build a snow man. I remember having a bible study one evening at our home in Decatur Alabama a week before Christmas. Folks showed up just after supper around 6:30pm for a gathering when I was about 5 or 6 years old. I think the little kids watched the Wizard of Oz on TV while the grown ups were busy in another room.... but I may have my memories running together. Anyway, when it was all over and people were headed out to go home someone shouted "Hey! It Snowed!" That didn't mean much to me, as I had never seen the white stuff, but when I went to the door, my mouth dropped and we all ran out to play. Mom had to heard us back in the house to get our coats on, but I didn't argue, as my hands were already frozen within the first few seconds of rolling up a snowball. We ended up making a snowman and playing well into the night. School was cancelled, and the fun continued the next day. 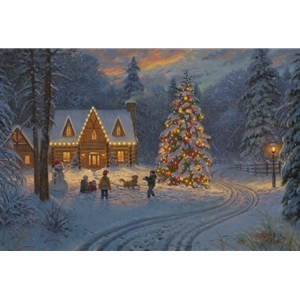 Mountain Christmas depicts this fun activity showing trampled snow and foot prints all about. The children haven't slowed down a bit, either. Still excited to throw a "snow bomb" and play till they are stiff with cold, they all know this won't last and might be the only snow of the year. Relive your favorite Christmas memories with me and enjoy another Mountain Christmas. Ps. Here is a photo of that evening. I'm the "bomb thrower" in the red coat. My sister, Wendy, is in the Yellow rain coat, and my brother Hampton on the right. Two neighbor kids (the Buffingtons) on the outter edges, and my sweet mother behind "Fred" the snowman.